The Old Town of Prague (Czech: Staré město) is the oldest settlement on the right bank. 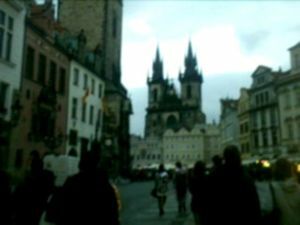 Old Town Square is the center of eventful history of Prague. The Gothic, Renaissance and Baroque buildings were preserved here. The Historical Centre, including most of the city’s major sites, became a UNESCO-listed site in 1992. Jan Hus monument— That striking man standing atop a patina-green metal mountain in the center of Old Town Square is not Jesus, though he resembles him. It's Jan Hus, the great Czech religious reformer whose Hussite movement caused as much, if not more, friction within the Christian community as Martin Luther. The statue was erected on the 500th anniversary of his death (6 July 1915). Hus preached in the Bethlehem Church in Old Town and was himself not particularly radical, unlike some of the sects who followed him. He believed in Bibles written in the worshiper's language, in the importance of faith instead of a clergyman's intermediation with God - in other words, concepts which threatened the status quo. He was summoned to the Church's Council of Constance in Switzerland by representatives of the Emperor, and given a letter of safe conduct to get there and back. Like every member of the Habsburg family, before and after him, the Emperor was Catholic. After Hus refused to repent for his so-called sins and come back into the Church, he was burned at the stake, despite the promise of the Emperor. 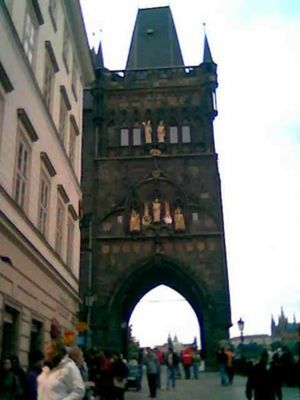 Charles Bridge (Czech: Karlův most)— This Gothic-style pedestrian bridge whose construction was completed in the late 1400s connects Old Town with the Lesser Quarter side. It is decorated by 30 statues, replicas of those erected in 1706 to 1714. (They were being cleaned during 2015 so may no longer be black as they appear in earlier photographs.) More than a convenient method for crossing the river, the bridge is a destination in itself particularly because of its three medieval towers. Vendors and buskers are often on the bridge but they are not aggressive. Access to a fenced platform at the top of a tower at each end of the bridge is available for a fee; the winding circular staircase in a narrow passage is recommended only for those in good health. Astronomical Clock (also called Orloj)— The Astronomical Clock located on a side tower of the Old Town Hall (reasonably enough, on Old Town Square) is easy to find - just wait until a few minutes before the hour and look for a large group of tourists standing around waiting for something to happen! It also one of the most popular gathering places in Prague. Built in 1410 and thought of as an example of 15th century hi-tech device, projected with participation of math and astronomy professor at Prague University. The mail dial is in principle mechanical astrolabe, showing not only the current time, but also the placement of Sun and Moon in Zodiac, phase of the moon, time of sunrise and sunset, length of astronomical night, time in old Bohemian hours, in unequal hours and other data. From gathering crowds, hardly anybody understands all data astronomical dial displays. Then there is a slow-moving 12-month calendar with incredibly delicate, small figure paintings by 19th century Czech painter Josef Manes. 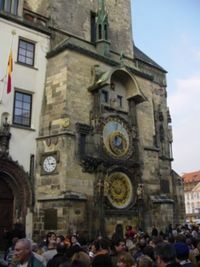 Every day on the hour, the upper, glockenspiel-style section of the clock performs the same scene: Death waves an hourglass, the 12 apostles shuffle past small windows, and a rooster crows. After the hour strikes, a Turk wags his head. Long after the Turks had ceased to be a threat in Central Europe, their use as an allegorical figure in genre paintings and other art continued. The Czechs often sided with the Hungarians in various battles against increasing imperial power as exercised by the ruling Habsburg family over their dominions, and though the Turks never occupied Prague as they did Budapest, both countries' artists used "the Turk" (a dark-complected figure, usually wearing a turban) to represent the dangers of the world, and especially threats to Christianity. In the astronomical clock, the Turk is meant to be the stranger. There is a legend about the clock that states the original master builder of its interior clockworks was blinded by the King who commissioned it after the work was completed so the mechanic could never build such a wonderful clock for someone else. Municipal Hall - Nám. Republiky 5. ph 222 002 101. fax 222 002 100. email [email protected] . The Obecní dům was built near the Powder Tower (a storage place for gunpowder and a major trade route entry into the city) on a site called King's Court where once a royal residence stood. In 1901, the Prague Civic Society made a proposal to city authorities to build a center for official and social Czech events. As happened so many other times in recent Prague history, the Czechs were trying to balance the grand buildings erected by the German-speaking community of Prague with suitable edifices of their own. The "German House" (now co-opted and renamed Slovanský dům, or Slavic House, on Na Příkopě street) and a German casino were enough to make the Czechs want a place of their own. Lovers of Art Nouveau should bless the memories of the Prague Civic Society's officials, because the Obecní dům would become one of the most beautiful examples of Art Nouveau in Prague, filled with artwork by the best Czech artists of the day. Neo-Baroque, neo-Renaissance, Western and Oriental influences – all combined with traditional Czech Art Nouveau. This is what makes the Obecnàdum unique among many beautiful examples of Art Nouveau public buildings in Prague. While the exterior is impressive, the interior is both finely crafted and educational. Almost every prominent living Czech artist worked on the Obecní dům. Painters Mikoláš Aleš, Václav Jansa, Alfons Mucha, Jakub Obrovský, Jan Preisler, Josef Wenig, Karel Spillar, Max Švabinský, Josef Ullman, František Zenoek, and the sculptors Josef Maratka, Josef Václav Myslbek, Karel Novak, Ladislav Šaloun, František Uprka, Bohumil Kafka and Čeněk Vosmík carved out an astounding backdrop for the many historical events that would transpire here. Though their contributions are not conspicuously noted, in some cases (such as Alfons Mucha's Mayoral Hall) it is obviously which artist decorated what room. Residence Rybná, (next to Old Town Square), . 500-year-old building formerly called At The Red Horse, rebuilt in the 19th century in the late classicist style. Recently renovated and refurnished. 1-3 bedroom apartments. Friendly professional staff. From €100-250 per apartment. The U Prince, (facing the Astronomical clock), . Comfortable beds and beautiful marble bathrooms. The terrace bar has a view of the city and Old Town Square.